The Congress will be split between two venues: Christchurch Central City YMCA and Lincoln University. Accommodation and plenary talks will be in Christchurch at the Central City YMCA. Each day after plenary talks, charter buses will take delegates to Lincoln University for the rest of the day. The chartered buses will only take about 30 minutes to travel to Lincoln and will give delegates plenty of time to discuss the fascinating plenary talks on the way to Lincoln and the day’s regular talks on the way back to the city. 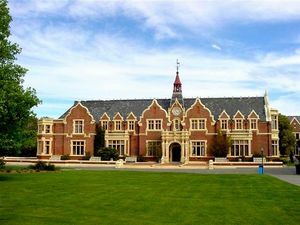 Lincoln University is the smallest of New Zealand's eight universities and is the oldest agricultural tertiary institution in the Southern Hemisphere. Set in an awe-inspiring region of snow-capped mountains, crystal-clear rivers, and vast turquoise lakes, Christchurch is a city of scenic views, fascinating history and friendly kiwi culture. The city itself lies in the agricultural Canterbury Plains, but a short drive will take you into the Southern Alps, made famous as the filmset for the Misty Mountains of JRR Tolkein’s The Lord of the Rings. Christchurch is the oldest, and third largest, city in New Zealand. It is located near the east coast of the South Island, in the Ngai Tahu tribal area. While the mainstay of the city’s economy is agriculture, Christchurch boasts a thriving cultural scene, with plenty of opportunities to become immersed in kiwi culture. From traditional English-style pubs and cafes to an array of exotic restaurants, the major influences on Christchurch’s culinary scene are from the United Kingdom and Asia. 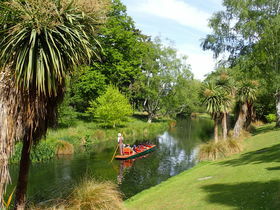 Hagley Park and the Botanic Gardens are large green spaces near the City Centre, showcasing many native and exotic plants as well as local art and culture. At the edge of the Botanic Gardens is Canterbury Museum, home to the collections of such pioneers as Julius von Haast and Raymond Forster. The Museum’s Victorian building houses collections describing the human and natural history of the Canterbury Plains, including Maori artefacts, the bones of extinct giant moa birds, and a comprehensive collection from Antarctic expeditions. 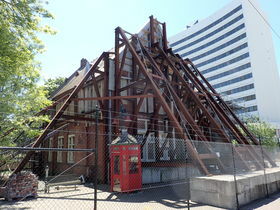 In 2010 and 2011, Christchurch was shaken by four major earthquakes (5.8 – 7.1 on the Richter scale). Many historic buildings were damaged or destroyed; homes, livelihoods and lives were lost. In the aftermath of these tragedies, the spirit of the people of Christchurch created a feeling of strength and community. Shops damaged in the quakes were resurrected in shipping containers as the Re:Start mall, a new cathedral was constructed out of cardboard, and locals made beautiful and haunting artwork from pieces of the rubble. Feelings surrounding the earthquakes are still raw, but the people of Christchurch are open about the reality of the quakes. There are bus tours of the Red Zone, and a special museum, Quake City, dedicated to displaying the reality of the earthquakes. Getting around Christchurch is easy: it is a small, friendly and easily navigable city. Christchurch roads have a grid structure, going north to south and east to west. If you see pointed mountains, you are heading west. If you see rounded hills, you are heading east. The buses are colour-coded and not usually more than a few minutes late. 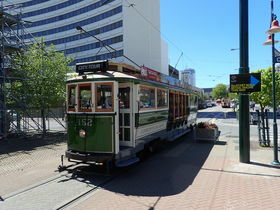 In the city centre there is a tramway that is heavily used by tourists. Several taxi companies service the area, and cars are easy and relatively cheap to rent. Most locals drive around the city, as traffic is usually flowing. Cycling is also popular as there are many cycle paths and bike hitches, particularly around the centre. However, motorists show little sympathy towards cyclists, and outside the city, cycling is considerably more dangerous as the traffic is fast and the cycle paths few.